ELIZABETH CITY, NC –– Modern American muscle is packed in this fourth-generation 2016 Dodge Challenger. It’s performance matches up with its predecessors while its technology thrills younger generations all together delivering a legendary driving experience. 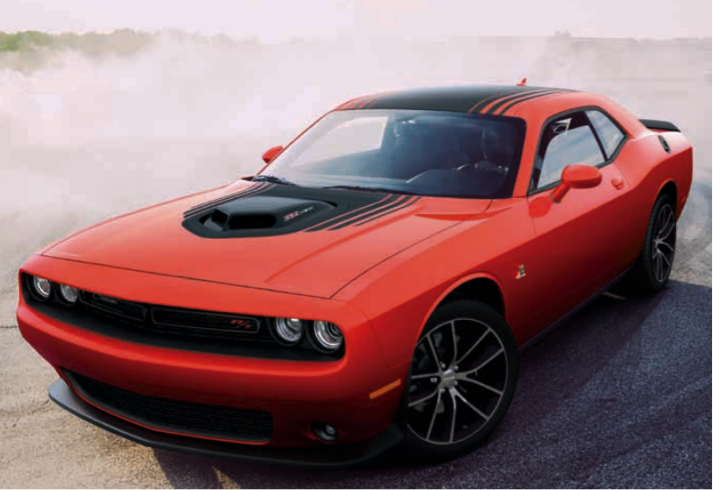 To learn all about the 2016 Dodge Challenger, download the brochure below. The 2016 Dodge Challenger is made for those that wished for a race car every single birthday. The Challenger was designed with it’s iconic heritage in mind. Projector headlamps, quad halo LED surrounds, heritage split grille, and the hoods power-bulge all contribute to its intimidating stance. The tech like the digital gauge cluster and the 8.4 inch touchscreen display with Uconnect. is all modern while the atmosphere remains retro. Your friends can enjoy the ride too as the Challenger is the only vehicle in its class able to seat 5 passengers. What you should care most about in this muscle car is the power and performance. Seven options for Engines and trasnmissions range from 3.6L Pentastar VVT V6 with TorqueFlite 8-speed automatic to Supercharged 6.2L SRT Hellcat HEMI V8 with TorqueFlite high-performance 8 speed automatic transition. It can support 707 Hp, 650 lb-ft of torque, a quarter-mile time of 10.8 seconds, and top speed of 199 MPH. 12 color options, body stripe and graphic options, 8 interior trim choices, and 10 wheel choices allow you to make this beast your own. To see all the options and details on features, download the 2016 Dodge Challenger brochure. If you decide power is what you want, stop by Perry Auto Group to purchase or lease your 2016 Dodge Challenger. Perry Auto Group has two dealership locations to serve you better at 1005 W. Ehringhaus St, Elizabeth City, NC, 27909 or 1001 Halstead Blvd Elizabeth City, NC 27909. Stop in for any of your auto or community needs, or feel free to give us a call at (252) 338-9100.